If you haven't shopped at Born Pretty Store you are missing out. They have the most amazing nail art gems. Nail wraps, water decals, 3D stones and gems, spikes, lace, studs, rhinestones, and everything you can possibly think of. To purchase these click here or search for item ID: 9839 in #3. Don't forget to use code "GYL91" for 10% off your entire order! I've used nail wraps before and these were THE BEST I have ever used. So easy to apply, they stick on so well, easy to fill off, and they fit so natural on the nail! With Sally Hansen's I've had them come out rough at the cuticles. Bonus: These glow in the dark without a black light. I didn't even realize it until I went to bed last night and saw that my fingernails were glowing SO bright. 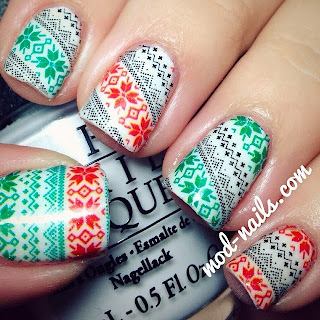 PLEASE VOTE FOR MY CHRISTMAS NAILS!